At least three people were forcibly removed from a park in Tokyo where homeless people have been protesting against building work going on in preparation for the 2020 Olympics. There are plans to build four new skyscrapers in the park in Shibuya, the megacity’s bustling shopping district. But the park has been occupied and used as a place to sleep by some of the city’s homeless population, leading to protests by the rough sleepers and sympathetic activists. Construction workers and police officers began erecting fences in and around the park on Monday, leading to clashes when activists tried to resist the clearance of the area. One activist, Ogawa, said three people were arrested. Almost a quarter of Tokyo’s estimated 6,235 homeless people live in the city’s parks. Kazuhiro Okuno, the head of urban development for Shibuya, last month told Reuters that public housing had been made available to people affected by building work. Almost a quarter of Tokyo’s estimated 6,235 homeless people live in the parks of the metropolitan area, according to a recent Japanese government report. Some independent organisation said the government figures failed to consider those sleeping rough in the suburbs. Protests against the clearance of homeless camps and low-income housing has marred preparation for successive international sports events. In 2010, The Big Issue reported on slum clearances in the centre of Indian capital Delhi ahead of the Commonwealth Games. Both London’s Olympics 2012 and the Glasgow’s 2014 Commonwealth Games saw resistance to the demolition of existing housing schemes for stadia and new homes. 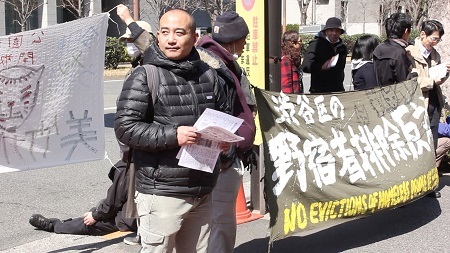 Photo: As the battle over Shibuyu Park heats up ahead of the 2020 Tokyo Olympics, homeless people defender Munenori Yamakawa and other opponents of the redevelopment plan have accused the ward of disregarding the plight of the homeless that use the park and of ignoring dissenting voices. Source: Michael Penn/Japan Times.